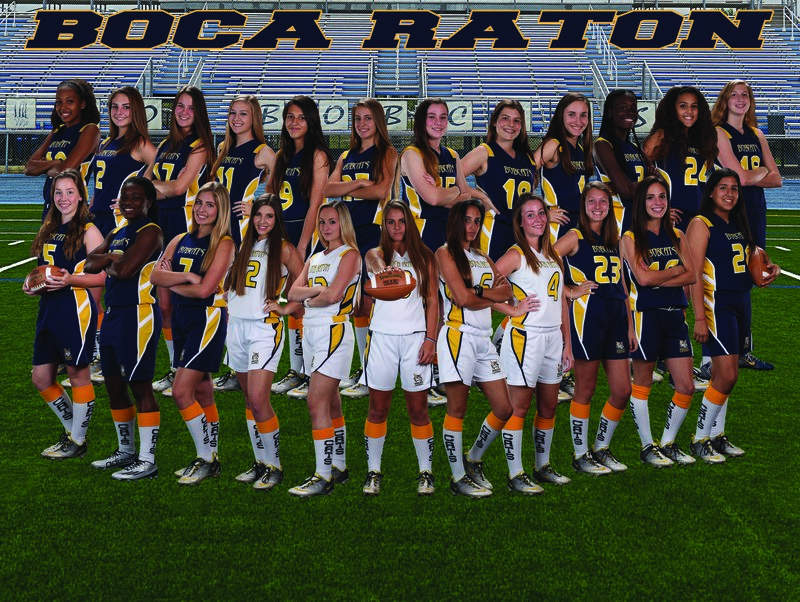 The Boca Raton High School ladies flag football team has been one to set the standard for the district in the past. Winning district championships four of the past six years, the Bobcats’ 5-7 season wasn’t the outcome that the team had hoped for. The beginning of the season had a rocky start. A team where most of the players were juniors on the 2015 District Championship team, Coach Al had high hopes for the season. However, with the season being at the same time as prom, testing, finals and college visits for the seniors, it was hard for Coach Al to get commitment from the team’s leaders. Coach Al made a difficult decision, and from the girls who would not be able to commit to flag football this past season, he had to make some cuts. With 19 of the squad of 23 being freshmen and sophomores, Coach Al made this season a rebuilding season. Most of the girls were new to the sport and had little to no knowledge about the sport, so Coach Al had to rebuild and reteach. Although the team consisted mostly of underclassmen, Coach Al still maintained many girls down on the Junior Varsity Flag Football team, so that they could create and cultivate a winning attitude. “I wanted to set a solid foundation and I think we accomplished that,” said Coach Al. Although the Varsity team went won 5 games and lost 7, the JV team went 13 and 0. Coming from 14 seasons at Spanish River High School and taking his 2006 team to States, Coach Al is a decorated coach. Although he was used to always winning, in the rebuilding season Coach Al proved that it’s not only about winning, but it’s more than that. Boca High’s ladies Flag Football team started the season ranked 7th in the state but with the misfortunes that arose they fell in ranking, however from the difficulties, blossomed growing opportunities. Looking back at the season and the team’s performance against the schools who made it to the District Championship, Coach Al observed that they only lost by a touchdown. “We lost to those teams with one touchdown away with basically no experience,” said Coach Al. But one of the girls who did have experience was Hannah Pratt, who won First Team All-County for the 2015 season. And with 30 interceptions in 12 games, it’s highly likely that she will make First Team All-County again this season. For the coming season Coach Al is optimistic, but makes the observation that he needs to get more commitment from the girls. “If the commitment is there we can be good,” affirmed Coach Al. He has high hopes for the coming season and doesn’t go easy on the girls. By teaching them football just like the boys, he knows that by planting that seed of football knowledge that it’ll only benefit the girls. Coach Al made it a point that, “these girls can walk onto the field and tell you what coverage the defense is in.” Hoping that the girls got the taste of winning and that that they get to love the sport, he remains optimistic and makes sure that the girls still have fun. Things that he thought was going to be their weak spots was actually their strong points, but looking forward for the following season he knows that he has to get all of the girls on the same page offensively and that they have to work on their timing offensively. Coach Al also has a ladies travel flag football team, called the Wildcats travel flag football team, which gives the girls on his team who want to continue to be active in the sport year-round the opportunity to grow in the sport. Because there is no league in the area the team plays in tournaments all around the US, Canada and even Central America. The Wildcat travel flag football team will have their first tournament in Lake Worth on June 4 and 5th. As for the Palm Beach County high school flag football season, as it comes to a close the All-Star game will be held at the Boca High field on May 19th at 7 p.m.